When it comes to bone regeneration, magnetic particles are not the first idea that surfaces in thought. However, magnetic nanoparticles have become an ever-increasing topic of interest for biomedical applications with promise in targeted drug delivery and possible uses in bioimaging. But they also show potential in contributing to the regenerative capabilities of bioscaffolds. Figure 1 Graphical summary of the process of creating the Collagen-Chitosan scaffold cross linked using EDC in NHS buffer. The mineralisation of hydroxyapatite and magnetic nanoparticles by increasing the pH. The newly formed scaffolds were then evaluated by observing the cell proliferation of osteoblasts as well as monitoring the mineralization of bone defects in rat craniums. The exact mechanism by which the presence of magnetic nanoparticles augments the bioactivity of the scaffolds is still unknown. The authors postulate that the magnetocaloric effect, a phenomenon where a changing magnetic field causes a change in temperature in a material, contributes to the processes during bone regeneration. The yet cryptic benefit magnetic nanoparticles in osteogenesis opens a gateway to new research in a more complex and multifaceted approaches to wound regeneration. Figure 2 Schematic denoting the strategy of facilitated endogenous bone tissue engineering. 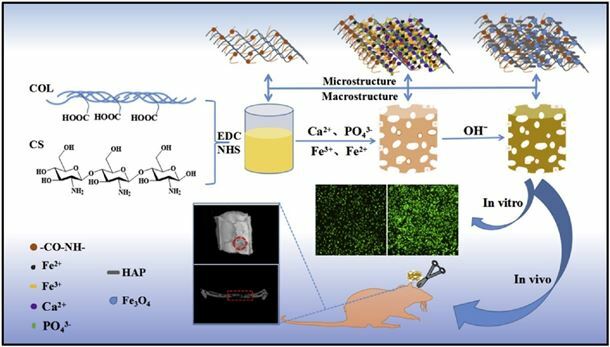 Driven by the magnetocaloric effect of ambient magnetic field in the earth, magnetic scaffold could in situ recruit endogenous stem cells and chemokines to damaged sites and facilitate osteogenic differentiation to achieve endogenous bone tissue regeneration. The effect of the magnetic nanoparticles was studied through characterisation of the scaffolds’ structure, porosity and mechanical properties. This included SEM-EDS and XPS for physiochemical characterisation. However, as with all materials intended for implantation in the body, the significance of the magnetic functionalisation lies in its effects on cells and in vivo. This was assessed in the study by imaging osteoblast proliferation and the regenerative capability was measured in the repair of defects in murine bone crania. The scaffolds were observed to have superior biomineralized properties when containing the magnetic nanoparticles.